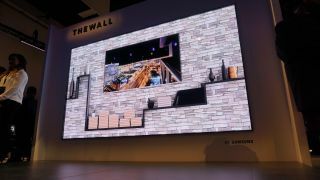 Samsung has announced at IFA 2018 that its innovative micro LED TV, 'The Wall', is now available in Europe, in a move that will see TV nerds everywhere rejoice. First revealed at CES 2018, 'The Wall' is the world's first fully customizable LED, bezel-less display, comprising a number of separate screens that can be configured in any number of ways. If you're a traditionalist, you'll probably want to stick to the standard rectangular TV shape, but for the more adventurous among you, you can experiment with lots of different shapes. When The Wall was first unveiled in January, it was unclear whether it would be available for commercial installations only as it came in at a whopping 146 inches, however it's now clear that modular viewing will soon be a reality in the home too. The TV doesn't come in a set size, as Samsung will reportedly allow customers to choose which size they would like, meaning The Wall is completely customizable for any space. If, on the off chance, 146 inches isn't quite big enough for you, it's possible to connect The Wall to other identical models to form an even bigger screen. Although Samsung didn't announce how you can order the colossal display, we expect more information to come to light throughout the rest of the IFA conference.